In Heart of “Redskins Territory,” Shadow of Ravens Roost, Steelers Nation Stands Strong! But in the late 70’s, as the Cold War was heating up again, there were no Soviet spies in Dino’s, just Steelers fans. At least there was one. His name was George. He had the front seat on the left hand side, closest to the front of the store. Along either side of his mirror, he had the Iron City cans that featured the Super Steelers. If memory serves, he also had a framed copy of the Sports Illustrated cover of Terry Bradshaw and Willie Stargell’s joint sportsman of the year award. At age 6, even though I was well acquainted with the 4 hour drive to Pittsburgh, this seemed “normal” to me. After all, when my folks had taken me to Sears to get me a winter jacket, there’d been a rack divided in equal proportions of Redskins, Cowboys, and Steelers jackets. Coming at the end of the Super Steelers Dynasty, this would change quickly. Just as I reached double digits, Joe Gibbs was working his magic in Washington. …Yes, even though suburban Maryland of the 80’s was very much a land of transplants, if you weren’t a Redskins fan, in most people’s minds it automatically made you a Cowboys fan. Although George the barber remained faithful to his Steelers roots, visual evidence of the nascent phenomenon that we now know as Steelers Nation became sparse. 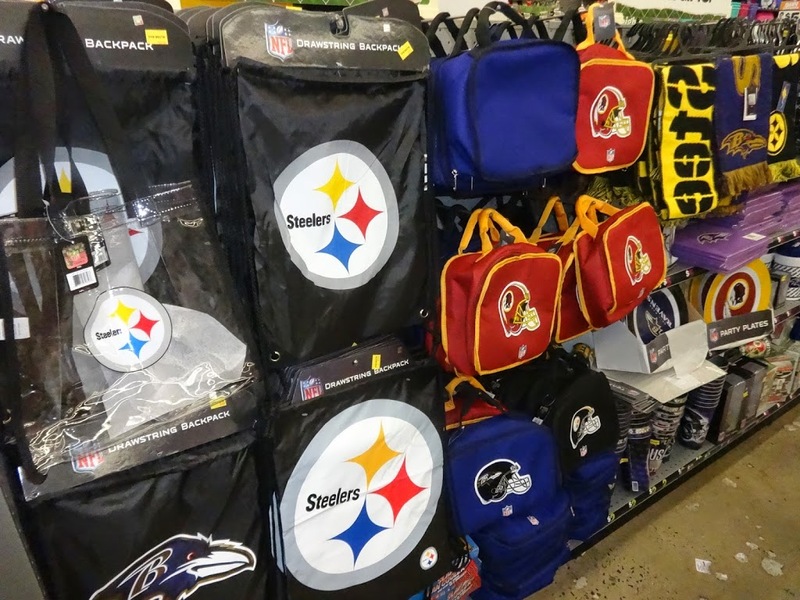 Yes, you could find Steelers stuff, but only in equal proportions with the other 27 NFL teams. Fans didn’t give up on the Black and Gold in the ‘80’s, but there was no internet, no Sunday Ticket, no Redzone, and mediocre teams don’t draw that much coverage. 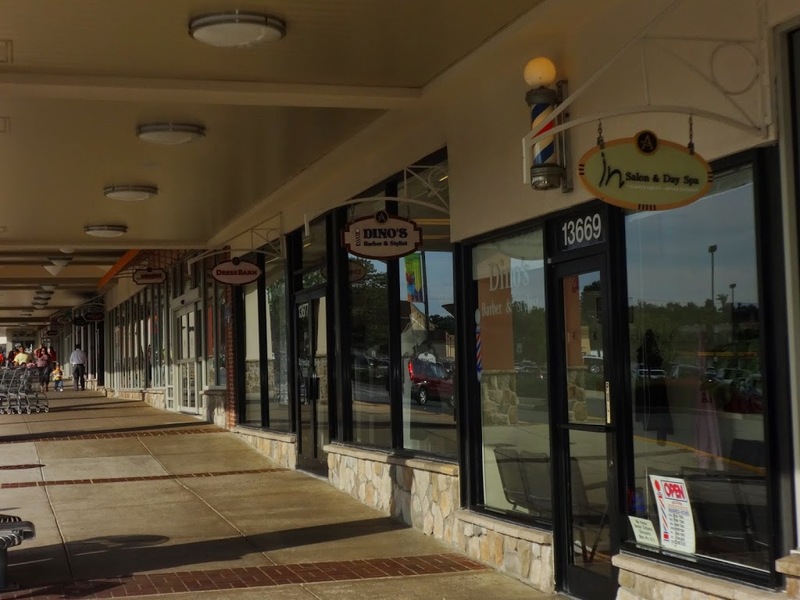 A recent trip back to my old stomping grounds in Aspen Hill showed the Aspen Hill Shopping Center alive and well although changed. Dino’s is still there, although George is long gone – having been upset when Dino expanded but declined to delegate management of his new stores to the old hands. Peering through the window I saw that Italo, my dad’s old barber, was still there. 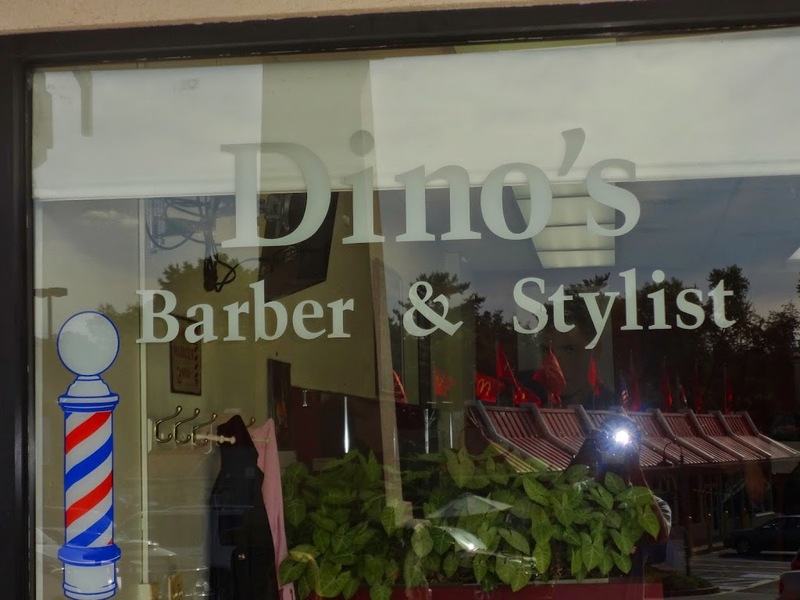 He, like Dino’s itself, is a survivor of a strip mall that has seen incredible turnover. But alas, peering inside, no evidence of Steelers Nation was apparent in Dinos. A few doors down, it was a different story. Redskins stuff was obvious. Although Daniel Snyder seems intent on discovering just where their goodwill reaches the breaking point, the truth is the Washington Redskins have a loyal fan base. To outsiders, the Ravens might seem an obvious choice, and perhaps it is, but it caused a raised eyebrow nonetheless. The last NFL season in which I lived in the US (and Aspen Hill) was 2000, the year the Redskins won hands down the off season Lombardi, and the Ravens won their first real Lombardi. As the two franchises were crossing their respective thresholds to fantasy and reality, you could pick up a subtle undercurrent of support for the Ravens among life-long Redskins fans. So perhaps the beach head that the Ravens roost laid has grown roots since then. Of course there is no such easy explanation to “justify” the Black and Gold robust representation in this retail sector. And it wasn’t just with the backpacks. 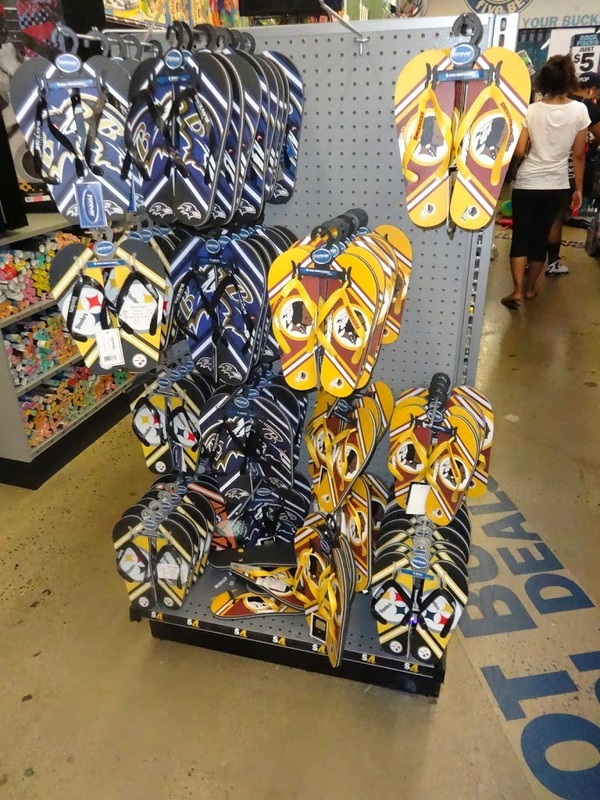 Yes, ladies and gentleman, in the heart of “Redskins Territory,” in the shadow of the Ravens Roost, the footprints of Steelers Nation leave their indelible mark. The really cool thing about this is that a chain like 5 Below almost certainly manages its stock based on a supply and distribution business intelligence algorithm. In other words, they have a computer program that directs merchandise to where it sells. That means there are plenty of Steelers fans in Aspen Hill Maryland. Like all good vacations, ours came to an end. The first leg of our trek back to Buenos Aires began at Washington National Airport, located in Virginia just across the river. As we waited to board, my wife again called my attention to something in in the distance. 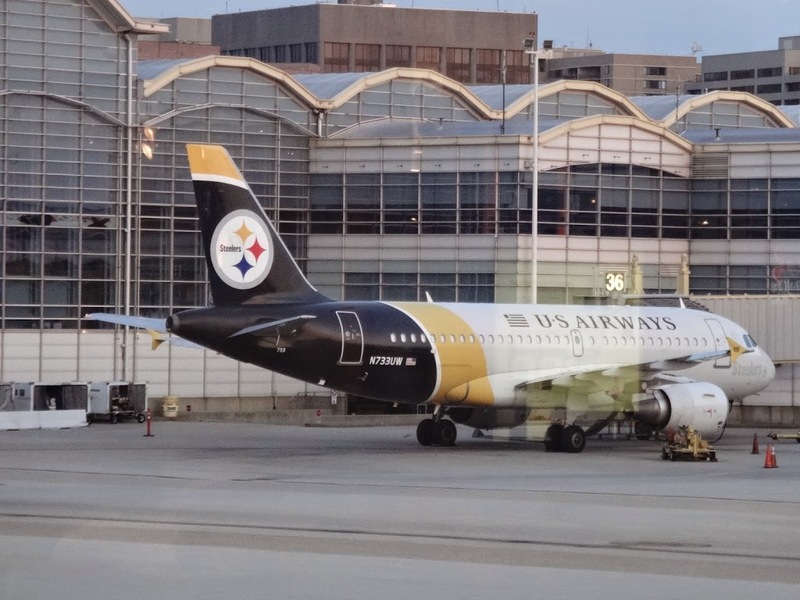 But it’s still part of Steelers Nation! This entry was posted in Steelers 2008 season, Steelers Nation and tagged Ben Roethlisberger, Byron Leftwich, Pittsburgh Steelers, Steelers vs. Ravens, Steelers vs. Redskins, Terry Bradshaw. Bookmark the permalink. 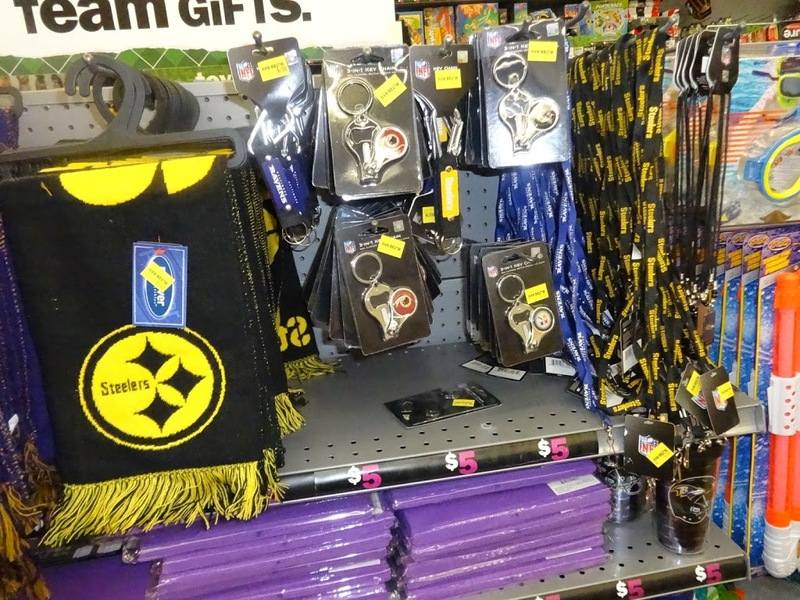 Or, it could all just be that no one has been buying all the black and gold paraphernalia? Especially as the Washington Redskins are poised to recreate their glory first realized under George Preston Marshall, then rubbed to a luster by George Allen, only to be brought to a glorious shine under the first Joe Gibbs era! Well, that is a plausible explanation. 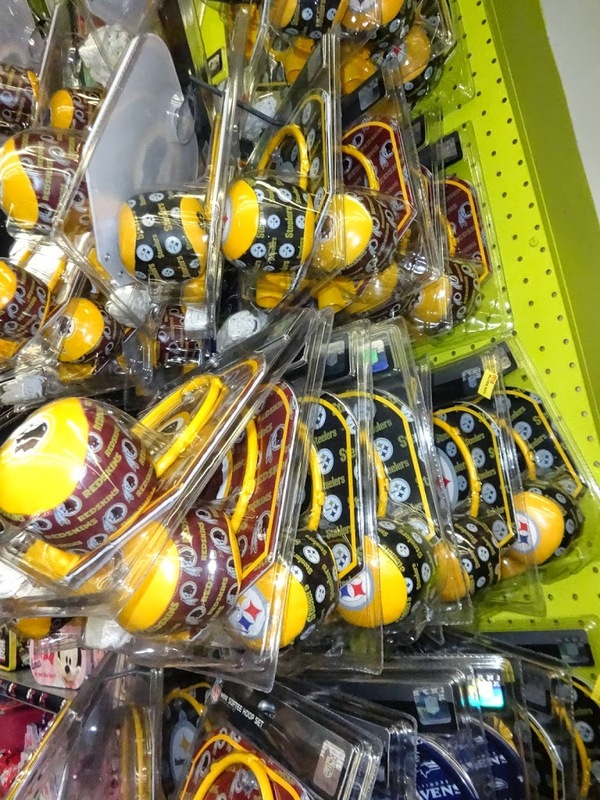 But if that is the case, then they’re not selling a lot of Redskins stuff either….. Thanks for commenting.